Globetrotter B&B is an antique building that has been recently renovated. We are located in the historical center of Catania, between the old fish market and Ursino castle, 200m from the central square, cathedral, and Via Etnea. Globetrotter is within walking distance from main monuments, restaurants, pubs, and discos. The airport is 15 minutes by car and 5 minutes from railway station and port. Etna excursions with professional guide. Massage and solarium center . meal in typical restaurants and pizzeria from 10 euros per person. B&B is located 5 km from the airport, 1 km from the railway station, 300 metres from the port, 700 metres from the beach, 30 minutes from Etna, 40 minutes from Taormina and 60 minutes from Siracusa. 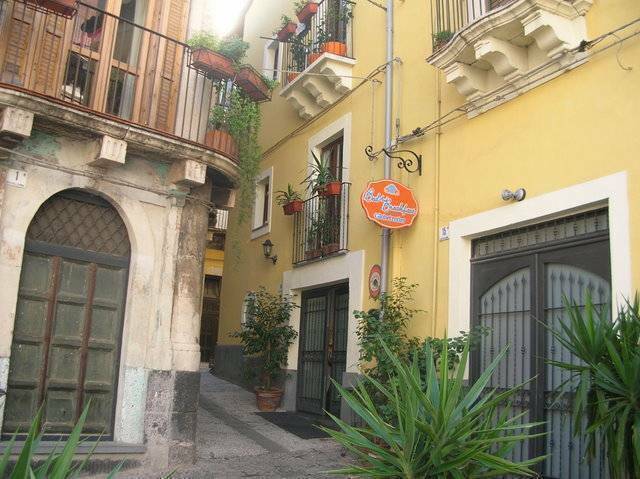 Globetrotter B&B is located in the heart of the historical centre of Catania next to the old fish market A Piscaria, 100 metres from the Duomo Square with the cathedral and elephant . Behind the B&B you will find the Ursino Castle and further down the street there is the greek theatre, Roman amphitheatre and the famous Via Crociferi with Bellinis Home. Via Etnea begins from the Duomo Square which is filled with several churches built in late baroque period (World heritage UNESCO) where you can go shopping during the day and party during the night all year round. You can cancel your reservation but at least 7 days before your arrival day, otherways youll lose the first night. We look forward for your answer as soon as possible. From the arrival point at the airport you can catch a bus every 20 minutes to get to the city center (from 5:00 till 24:00) which will reach the historical centre in about 15 minutes, ask the driver to go to the Duomo Square then to Mazzinis Square and then Via Auteri 40-Vicolo della Lanterna 14 (5 minutes walking). from the railway station you have to get a bus, (431-439-427) which will bring you to the Duomo Square in 10 minutes, then go to Mazzinis Square and Via Auteri 40-Vicolo della Lanterna 14 (5 minutes walking).